A 3 ingredient, dairy-free caramel topping that will take you under 10 minutes to make! Place honey in a small frying pan and heat on medium-low heat for 4 minutes, stirring constantly with a fork or spoon. The honey will begin to foam. Don’t worry, this is good! Add nut butter and vanilla and continue stirring for 1-2 minutes, until big bubbles form and the mixture pulls away from the side slightly. The longer you cook it, the harder it will get. Because this is a natural caramel, it will not hold up well at room temperature. 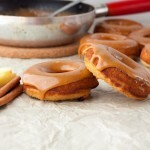 Once you’ve dipped the doughnuts, serve immediately or place in the fridge or freezer. 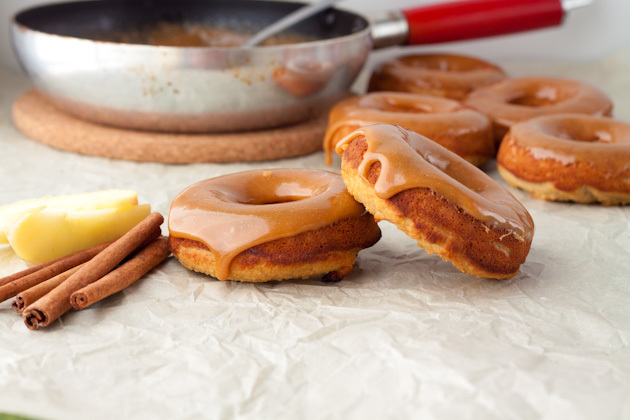 The caramel will melt on you if you leave it out! But don’t worry, the doughnuts will still be just as tasty regardless. If you don’t want a hard topping (exactly the consistency of caramel on a caramel apple) don’t cook the honey as long.